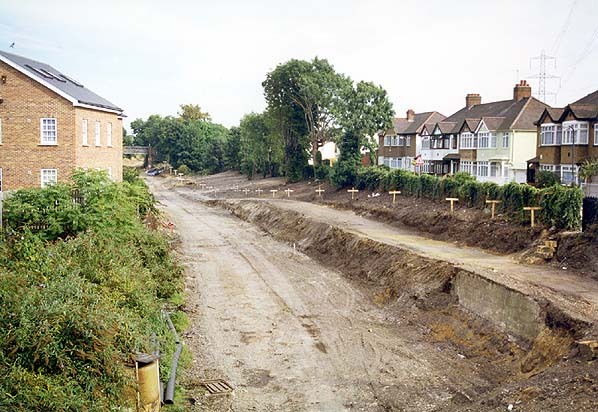 Present state: The Wimbledon platform has been demolished and Croydon Tramlink now runs through the site. The new Mitcham tram stop has been built at the east end of the station. The former Croydon platform is partly buried but the overgrown edge of it is visible. The original entrance building is listed and has now been renovated for residential use and is called Station Court. 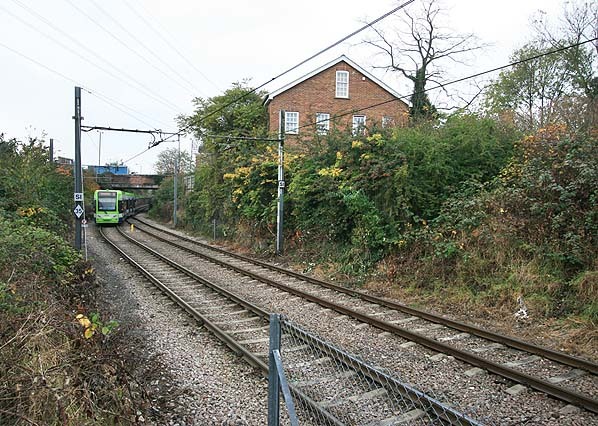 Notes: Mitcham was one of the two intermediate stations that opened with the line utilising an existing house on the east side of London Road as it's entrance building. This building dates from the late 18th or early 19th century and is said to have been used as office by the Surrey Iron Railway although there is co verification of this. on the north side serving a coal yard a civil engineers' depot and the ballast pit.This was initially for freight only and was known as the 'ballast siding' running to a ballast pit near the goods station. In time it was decided to upgrade this siding to a second passenger line and a second platform was added. 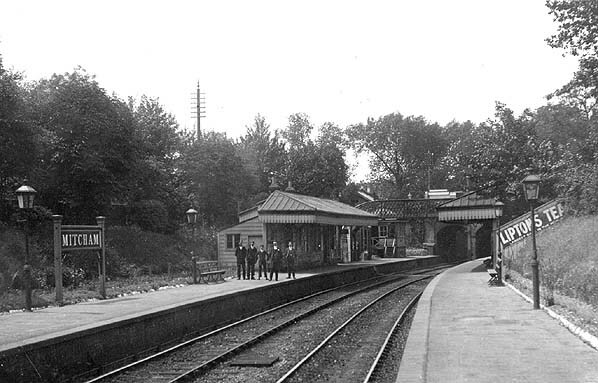 New wooden buildings were provided on both platforms and a footbridge was provided at the west end of the station. The main booking office was attached to the adapted house but there was second smaller booking office at an entrance in London Road that led onto the original platform, this was taken out of use when the footbridge was built. The original 14 lever signalbox was located at the west end of the Croydon platform but this was replaced by a new 24 lever box on the opposite side of the line in 1891. In 1929 further sidings were laid to the east of the station on the south side of the line and extended southward to the St. Helier Estate which was under construction at this time. The siding was lifted on completion of the St' Helier Estate but the southern end remained in use for some years after the estate was completed. The goods depot was closed on 1st May 1967.
subway. In 1989 a new brick booking office was erected on the platform accessed from stairs up to a new opening on the bridge parapet. this was only staffed during morning peak hours. The original entrance building was closed at this time and the listed building has since been renovated for residential use and a second similar building erected at the rear of the courtyard. the estate is called Station Court. After closure in 1997 the track was lifted in c.June 1998 and the platform demolished in August that year. The partly buried and overgrown remains of the former Croydon platform can still be seen. The new Mitch tram stop opened on 30th May 2000. 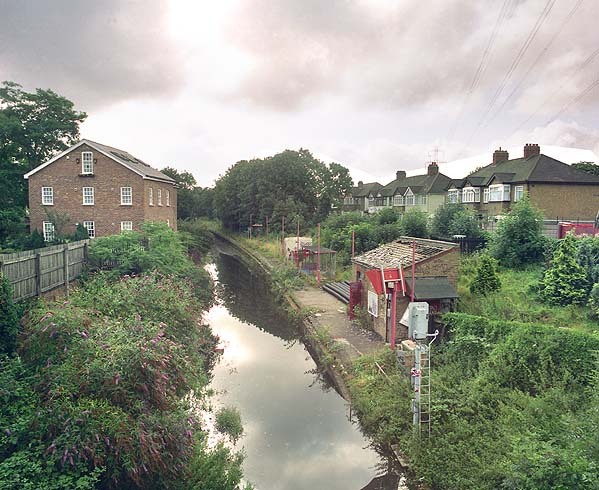 Before the coming of the railways the River Wandle was very heavily industrialised with 38 water mills and factories along its short length between Wandsworth and Croydon. As the river was not navigable, the mill owners required a means of transport for their goods so the Surrey Iron Railway was built between Wandsworth and Croydon. This was the earliest public railway in the London area and the first railway to receive parliamentary sanction in 1801. The 4' gauge double track horse drawn iron plateway was built by William Jessop and opened on 26th July 1803. The line was later extended south as the Croydon Merstham and Godstone Railway terminating at underground stone quarries at Merstham. Railway and the CM & GR to reach a new terminus at Waterloo Bridge from its existing Brighton line at Purley and in August that year the London & South Western Railway took an option to buy the SIR track bed but neither scheme was proceeded with and the SIR was eventually dissolved on 3rd August 1846 and the track bed reverted to agricultural use. It wasn't long before there were further proposals promoted by local interests. One of these was the Mitcham & South Western Junction Railway running from Mitcham Green to the LSWR at Earlsfield. 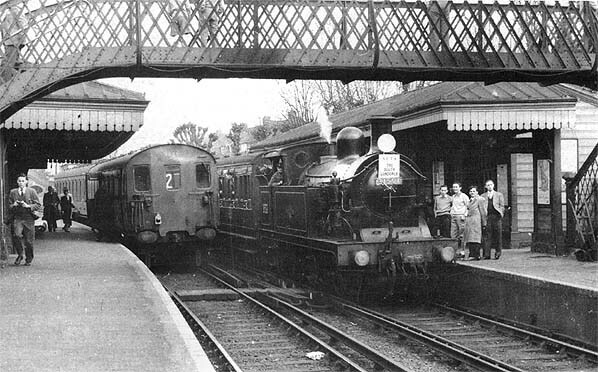 This was opposed by the LSWR but eventually an independent scheme to build a line from Wimbledon to Croydon was approved with the LSWR leasing the line between Wimbledon and Mitcham and the LBSCR leasing the remainder to a junction with its own line at West Croydon. The LSWR eventually pulled out of the scheme and the Wimbledon & Croydon Railway received its act in 1853 with a provision for working arrangements with the LSWR. for the remainder of the lease on the understanding that the Brighton could continue to work into Wimbledon. In 1862 a joint committee was set up to manage the line which was later purchased outright from the W & CR by the LB & SCR on 1st January 1866. The LSWR were offered a half share in the venture but declined only retaining an interested in the section shared with their proposed Wimbledon - Tooting route. On 1st October 1868, the LB & SCR opened their line from Peckham Rye to Sutton, this cut across Mitcham Common turning sharply to join the W & CR where a new shared station at Mitcham Junction was opened, beyond the station the new line diverged to the south and on towards Sutton. The Tooting Merton and Wimbledon Railway also opened on 1st October 1868 from Streatham Junction to Wimbledon, which was approached from two directions by lines diverging at Tooting Junction, one coming into the town from the north-east, the other from the south-east after forming a junction with the Wimbledon & Croydon at Merton. 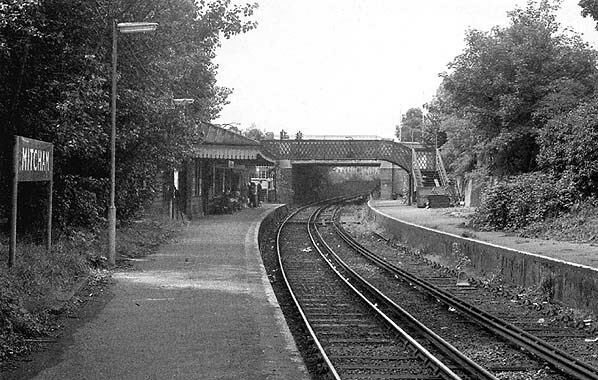 A station called Lower Merton was opened at the junction but this initially only had platforms on the Tooting line although a third platform was later added on the Croydon line opening on 1st November 1870.
reopened in 1923 but Beddington Lane and Morden Road remained unstaffed. With the opening of the Northern Line extension to Morden on 13th September 1926 passenger revenue form Merton Park, Morden Road (formerly Morden) and Mitcham declined rapidly although through journeys continued to attract a steady patronage. In 1927 there were 14 push-and-pull workings between Wimbledon and West Croydon, one extended to Crystal Palace Low Level, two from Wimbledon to Sutton via Mitcham Junction, and another from Mitcham to Crystal Palace Low Level; a similar service worked down. The line maintained healthy freight traffic, especially around Croydon and Waddon Marsh.In 1930 during the building of the London County Council's 825-acre St. Helier housing estate the contractors, laid an extensive temporary network of flat-bottom rails on cinder ballast to carry materials as required to the building sites, this being connected to the W&CR through a siding at Mitcham goods yard. This rail network which included 30ft bridge over the River Wandle was operated by six locomotives, shedded at a depot about a mile south of Mitcham. It was one of the last examples in southern England of a major public works contract relying on rail-delivered materials which were carried to site over specially-laid lines. Electrification of the Southern's suburban railway network was nearing completion by 1928 and approval was given for electrification of the W & CR on 7th July that year. With the increased frequency of trains after electrification of the line the Southern had to consider how this would affect the handling of the important freight traffic.The existing five booked freight workings between West Croydon and Mitcham (two extended to Wimbledon) and one or two daily as far as Waddon Marsh would have to be moved to the night hours to make room for the proposed electric service. 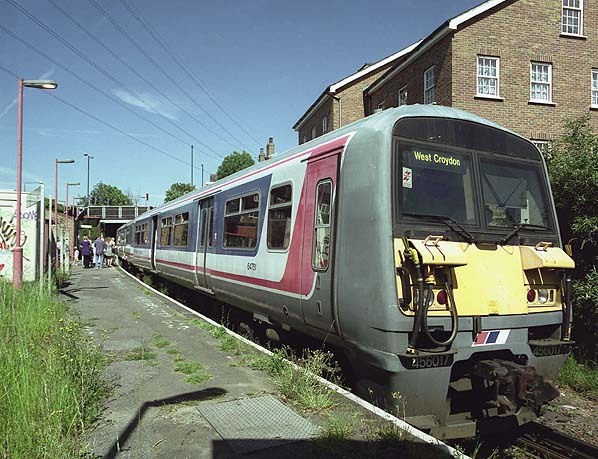 As such a change would incur extra costs and inconvenience to customers; it was proposed to construct another track between Beddington Lane and West Croydon to allow daytime freight working to continue. For much of its length this involved joining up already existing sidings to create the new line. 1932 6" Ordnance Survey map of Mitcham station and good station on both side of the line to the west of the station. To the east of the station the contractors line to the St. Helier Estate can also be seen. Mitcham Station looking west in 1971 during track lifting of the 'up' line following a landslip on the far side of the bridge that caused the 'u' platform to be taken out of service. which still stands alongside the road.